It’s been a busy year for Clover Networks, a startup that launched a consumer payment app in early 2012. The company’s gone full pivot, dumped its consumer slant, built a point of sale hardware system for merchants that would make Apple designers proud, and sold the company almost a year ago to one of the largest payment processing companies in the world, First Data. Not bad for a company that’s been around a little over two years and has around 50 employees. Also not bad for Clover’s investors including Andreessen Horowitz and Sutter Hill Ventures, as well as Clover’s co-founder and serial entrepreneur Leonard Speiser. Clover execs wouldn’t comment on the financial details of the acquisition. Clover’s over-arching goal — and the driving force behind both its software and hardware — is to create an open point of sale platform whereby merchants can use any number of apps that run on easy-to-use hardware and developers can build apps for any number of merchant verticals. Making hot hardware is just one way for Clover to get there. On Wednesday Clover is unveiling its “Clover Station” for the first time. Working with First Data, the Station is now commercially available and will cost between $500 and $1,000 depending on the options. 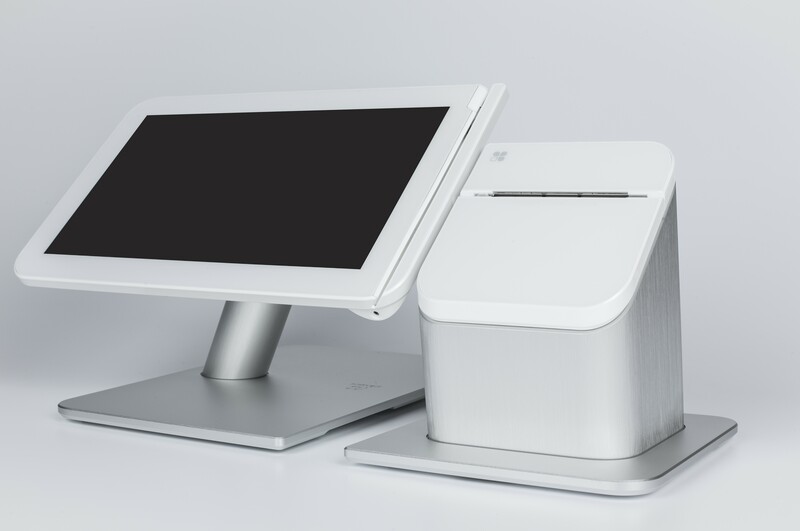 The product includes a touch screen running Clover’s management system and access to apps, a receipt printer, a card reader and a cash register. Basically everything a retailer needs to run a business in the connected iPhone age, from a restaurant to a doctor’s office to a hair salon (the company is targeting businesses that do over $150K a year in sales). Clover VP Mark Schulze says customers can get the system up and running, fully loaded with the merchants’ sales information, in less than 15 minutes. Clover’s designers, who hail from places like IDEO, Tesla, and Palm, used brushed aluminum for the bases of the Station and came up with a nifty (and patent pending) swivel for the screen — the merchant can quickly move the screen from merchant view, to customer view, and back to merchant. (GigaOM will be highlighting the best in design at our RoadMap conference next month in San Francisco). Other engineering goodies in the Station are that it can operate even when the Internet goes out, the base of the printer has four USB ports for accessories, it’s enabled for both ethernet and Wi-Fi, and it has one power source that connects all of the pieces. It’s pretty cute, too — it’s white accents are reminiscent of an Apple gadget, or even Square’s Stand (which will no doubt draw comparisons). Clover previously was shipping the more utilitarian Clover Hub to pilot customers, but now the Clover Station will replace that. While Clover has clearly spent considerable time designing its new Station, hardware isn’t the company’s end game and Clover isn’t looking to make a profit just on the Station. The big market potential could end up being in building the platform. 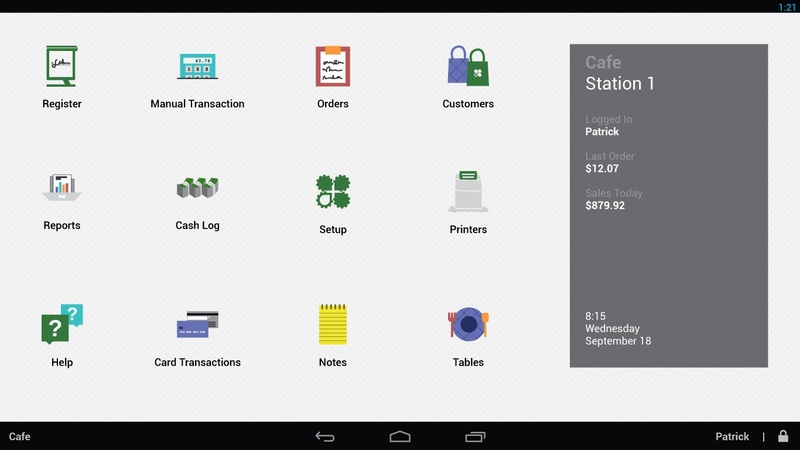 Using Clover’s cloud-based software, merchants can sync their point of sales systems across tablets. So say, a waiter takes an order, or updates a menu, at one end of the restaurant on a tablet, the entire system is updated. The Android-based operating system has other features merchants will probably appreciate like analytics that can slice up the retail data in any number of ways. Because the system is open, merchants can access new apps as they are built, whether Clover makes those apps or a third-party does. Killer apps (yes, the term is a cliche) can sometimes do more to bring customers onto a platform than the hardware itself. Back in the day I bought an iPhone so I could use Instagram (before the Android version was out). If a developer makes a really awesome merchant app that’s only available on the Clover system, it could have the same effect. Though, while it’s easy for a giant like Apple to attract the developer community, Clover and First Data will likely have to continue its outreach strategy to developers if it wants to get some really interesting merchant apps built. The aggressively open system is seemingly one of the company’s biggest differences with Square and its Square Stand plans. The other obvious difference is that Clover is targeting larger businesses than the ones that would normally use the Square reader. Clover’s optimal customers are businesses that are big enough to need to use software like employee management, sales analytics, and supply chain management. The underlying tech trend behind Clover — and Square, too — is the disruptive power that the cloud, connectivity and low cost hardware is having on new, formerly neglected, verticals. Small businesses and merchants have long been stuck buying products from slow moving, monopolistic companies that sell them devices and services that don’t work all that well and are frustrating to use. Now the lean hardware movement, app stores and cloud-synced tablets can make their way to restaurants and doctor’s offices in middle America. This is the same trend that is seeing farmers and the agriculture industry have access to new data and monitoring tools, or the energy industry use new visualization products. Or even Nest and its rethinking of the thermostat and the smoke detector. Long untouched sectors are starting to get access to cutting edge analytics, innovative services and the latest gadgets.